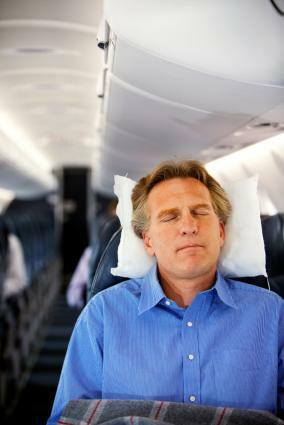 Preparing for an overseas trip can certainly be stressful. Using a packing checklist that includes items specific to international travel as well as standard packing items can help make the process manageable. Of course, packing needs vary from person to person and from trip to trip, while also varying based on season, expected activities and destination. When packing for a trip, it's important to consider all the relevant factors that might impact what you need to add to (or subtract) from the checklist you are using to prepare. 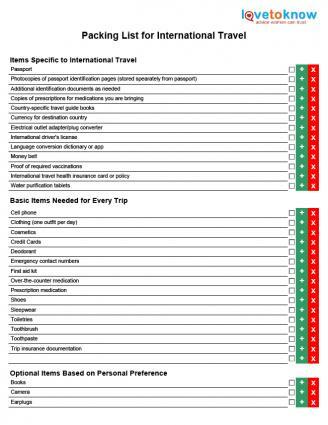 LoveToKnow has created a printable packing checklist for international travel designed to help ensure that you remember the basic items needed for any overseas trip. The attached printable, which you can access by clicking the top image, can easily be customized for your specific needs. Simply click the "-" sign to remove items that you do not need and click the "+" sign to add blank rows that you can label as needed. Use the diskette and printer icons in the menu bar to save and print the document as needed. 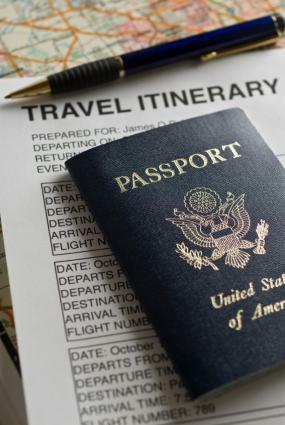 Documentation necessary to enter a foreign country and return home is essential for any overseas trip. Other items may be helpful or required based on where you are going and/or what you plan to do upon arrival. When preparing for a trip, it's also important to think about the types of activities you plan to engage in when getting your trip packing list together. Also consider if it may be more practical and cost-effective to rent some of the larger items you need when you arrive at your destination rather than paying overseas baggage fees. The activity-specific section is blank on the attached printable checklist; add line items for each activity you plan to participate in during your trip that you need to bring special equipment for. Trying to rely on memory when getting ready for an international trip can introduce unnecessary anxiety into a situation that's stressful enough on its own. If you're getting prepared for a trip, don't make the mistake of trying to keep track of the important task of packing by memory alone. Instead, download and customize the free printable trip packing list provided here so you can stay organized and be confident that you have everything you need.